BoJack Horseman is voiced by Will Arnett. The Netflix original series “BoJack Horseman” is an animated show created by Raphael Bob-Waksberg. The show, one of my favorites at the moment released its third season on Netflix earlier this summer and has been making waves ever since. The series follows an animated horse (voiced by Will Arnett) as he navigates the Birdman-esque woes of a washed up sitcom star. Alongside Arnett, the show features Aaron Paul, Alison Brie, Amy Sedaris and Paul F. Tompkins. 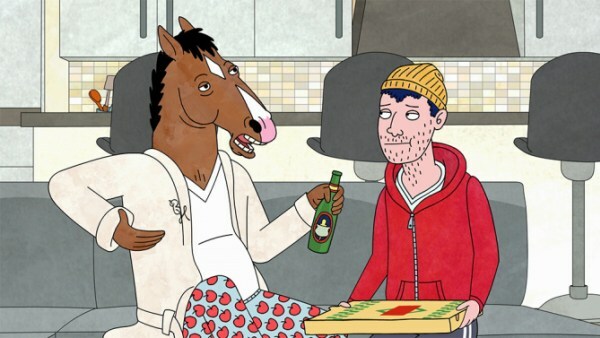 BoJack’s glory days were on the set of a family friendly television show, “Horsing Around,” but BoJack has since failed to produce anything of note as an artist. His fans have aged, and a beer belly has grown beneath his signature sweater. BoJack searches for happiness and meaning — attempting to find these things in relationships, homages to the past and new acting gigs. The plot follows BoJack alongside his “friends” — both human and animal — melding clever humor with a certain sadness that is refreshingly complex. For many different reasons (some self-inflicted) BoJack is not a happy horse, yet he constantly sabotages his best chances for happiness and redemption. The show’s genius lies in the fact that an animated horse traversing an absurd, pun-filled world can communicate the angles and complexities of sadness and the search for meaning many of us grapple with in our everyday lives. Alongside BoJack, you’re left to ask yourself if this is inescapable hopelessness or fetishized melancholy — and then if these two notions are mutually exclusive. As depressing as the show sounds, it extends far beyond dark humor trading upon the sadness that is BoJack’s life. The humor is delivered airily, but once it lands, the impact is intense. The puns are detailed and well thought out and the punchlines are often meaningful critiques of popular culture. An example: In the third season the character Mr. Peanutbutter (think Labrador retriever Ashton Kutcher) is forced to come up with Oscar nominees. On his whiteboard we see a crossed-out “black people?” The humor is also aptly delivered through the sheer breadth of characters. The show places comically subdued characters alongside caricatures of every character-type you can imagine in Hollywood (referred to as “Hollywoo” after someone steals the D from the sign). Journalist human Diane provides subtle quips regarding hipster/writer life while the very existence of the idiot-celebrity-Labrador, Mr. Peanut Butter is enough to make me laugh. The added factor of some characters being animals offers a parallel to a society of diverse backgrounds. In an episode where BoJack travels underwater we see him navigate a language barrier amongst the sea creatures, similar to Bill Murray’s exploits in “Lost In Translation.” The animals also provide the opportunity for some perfectly ripe, low-hanging-fruit puns: Princess Carolyn, a cat that is BoJack’s agent and best frenemy, drinks “catbernet” wine from the bottle and goes on dates with a mouse. More subtly, if you pay attention to the background jokes you’ll see a camel drinking water at a bar, or crickets in the audience of a comedy club. The genius of BoJack’s writing team is backed by an incredible soundtrack. My favorite episode of the season — “Fish Out of Water” has a perfectly paired soundtrack. BoJack ventures underwater for a film festival, and confined to an oxygen helmet, he’s unable to speak. The episode is kind of a narrative suspension (it floats — sorry, couldn’t resist a pun). Visually, we’re in the dreamy, alien, underwater world for the majority of the episode, and the music, which replaces the dialogue, matches the aquatic trance state. I’ll put praise aside for a moment to mention that this show is for the cynic in all of us, so if you’re not one to embrace your own, this show might not be for you. The show is undeniably dark, and the self-loathing, pessimism-drenched jokes often teeter on bad taste. In “That’s Too Much, Man!” the penultimate episode of season three, BoJack attends and boozes at an Alcoholics Anonymous meeting, a scene that unabashedly displays BoJack’s self-loathing and self-destruction. That being said, this show accomplishes a meaningful feat in 25-minute intervals. By the time the credits are rolling, you’ve seen bigtime commentary on the California drought, feminist analyses of teenage female pop singers and the condition of stardom. Simultaneously, you’ve felt connected to the smaller-time daily woes. I never knew daily nostalgia could be so effectively communicated by an animated penguin that works in publishing. Additionally, BoJack fandom isn’t limited by Netflix release dates. BoJack’s presence is fleshed out in his real-life social media personalities (the team of writers have produced my favorite comedic twitter account). It’s all in an effort to transition BoJack Horseman from a run-of-the-mill ‘Hollywood wash-up type’ to a living, feeling and ultimately relatable character.